The number of known bugs and insects in the United States is estimated to be more than 91,000. Some are beneficial, and some are dangerous to humans. Generally, we consider insects and bugs as pests, and many homeowners resort to using nasty chemicals to eliminate them. However, there are also ways to make a homemade bug spray that is a natural alternative to commercial bug sprays. If you are looking for ways on how to make your DIY bug spray to kill bugs without using toxic chemicals, this article might help. 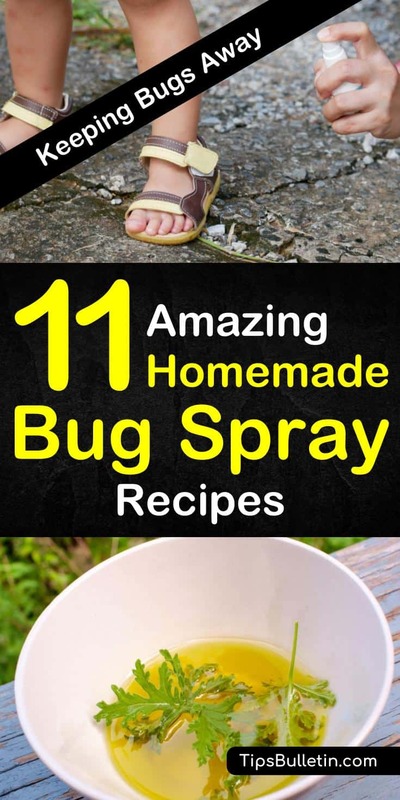 Here we have listed eleven recipes that use homemade products and essential oils to make a natural insect repellent spray to deter bugs. Why Use Homemade Bug Sprays? Citronella extracts are the first effective active ingredients utilized in mosquito repellents. Citronella is an Asian grass that people use for natural remedies. Since it has fragrant material properties, many believe that its chemical composition is responsible for its effectiveness as a repellent. Citronella is a classic DIY bug spray that is popular to many. It does fend off mosquitoes and bugs, but some of its properties may also limit its effectiveness. For example, it evaporates quickly after spraying. Also, you might need to keep reapplying the mixture for it to work well. Tea tree oil is another one of the versatile essential oils existing on the planet. You can use it for keeping the skin, nails, and hair healthy. Many researchers have found out that it also kills various bacteria and viruses. Its benefits don’t end there; it is also one of the best oils that repel mosquitoes and other insects. To make your natural bug repellent spray, combine all the ingredients listed above and spray on your skin before going out of the house to keep critters away. Lavender essential oils are active moth, flea, and mosquito repellents. It is safe for humans, some animals, and various species of plants. You can easily create your own bug spray. Combine all ingredients to make your homemade bug spray recipe, shake it well in your spray bottle and spritz in various areas of your household. You can also use it as a natural bug spray that you can keep in your pocket for personal use. The use of peppermint essential oil is not limited to aromatherapy. It can also repel stink bugs, rodents, and other creepy crawlies walking on earth. It works well as a natural bug spray because most bugs do not like the scent of peppermint. Mix the water and witch hazel in the spray bottle and add peppermint oil. Finally, shake the mixture, and voila! You now have a homemade bug spray that you can use to prevent bug bites. Some vegetable and plant-based oils contain natural insecticidal properties. These plant-based oils include grapeseed, jojoba, almond, olive, and neem. If you have one or two of these oils, you can use them to make a natural bug spray. Mix one or any of the plant-based oils listed above with the vodka into the spray bottle. Add essential oils if you want to make the mixture stronger. Shake the mixture well, and your homemade bug spray is ready for spritzing! Always shake before use and reapply when necessary. According to a published journal by the Agricultural and Food Chemistry (..), rose geranium essential oil is a very potent bug repellent. If you have pets or you are residing in a tick-prone area, consider adding a geranium essential oil in your bug repelling kit. For your DIY bug spray, mix all the ingredients listed above and spray in small amounts because it is incredibly potent. If you plan to spray it on your pets, avoid the face, their bellies, if they have open wounds, or if they are prone to licking their bodies. According to the USDA or US Department of Agriculture, some coconut oil compounds are more effective in repelling insects and bugs better than synthetic chemicals found in commercial bug sprays. As emphasized by the USDA scientists, the acids derived from coconut oil provide strong repelling effects to blood-sucking insects, bugs, and ticks (..). Pour the ingredients into the spray bottle. Close the cap and shake the mixture. After mixing your essential oil blend, your natural bug spray is ready to use. Shake the bottle before use. Lemon eucalyptus oil comes from a tree called gum eucalyptus. Like picaridin – a substance found in commercial bug sprays, lemon eucalyptus works not as actual insect repellant but as a mask that prevents insects such as mosquitoes to prevent them from locating their targets. Both lemon eucalyptus and picaridin have potential side effects like skin irritation. And due to potentially harmful effects, the US Food and Drug Administration or FDA, states that the latter is not safe for use with toddlers or children under three years old. Mix all of the ingredients, pour into a clean spray bottle, and your homemade bug spray is ready. Reapply after four hours when the spray evaporates. Fruit flies are one of the most annoying bugs in the world. Detering them may sometimes be challenging, but with the right ingredients, you can get rid of them quickly. This recipe will be useful in your home, especially in the kitchen. To be able to use for home remedies for flies, pour the apple cider vinegar in the bowl and add the dish soap. Put the mixture in a corner near fruits or vegetables and leave it for 24 hours. The flies will instinctively dive in and drown. To use apple cider vinegar as a spray, add one cup of water and pour all the ingredients in a spray bottle. Spray in an area where flies frequent. If you need a natural bug spray for your garden and you do not have essential oils for outdoor use, you can still make a DIY bug spray that does not involve chemicals and commercial pesticides. First, pulverize the mint, garlic, onion, and cayenne pepper. Strain the mixture and place it in a two-liter bottle or a clean, old vinegar container. Add the soap and the water into the mixture and shake well. Spray on any garden plants that are prone to bug attacks. Spritz in your garden one to two times a week. If you are having a hard time picking a specific essential oil that you will use for your bug spray because of the many benefits each of them offers, you can mix them. Here we have concocted some essential oils that can be safely combined. Mix all the essential oils into a clean bottle. Add the alcohol and shake well to combine. Then, pour the witch hazel and vegetable glycerin if available. Shake the mixture. Finally, add the vinegar or water and shake again. Your natural bug spray is now ready to use. Don’t forget to mix it before each use. The DIY bug spray recipes we listed above take only seconds when it comes to preparation. Aside from that, it is safe and toxin-free, compared to commercially-made bug sprays, which contains harmful substances such as DEET. DEET is short for N-diethyl-meta-toluamide. This chemical was found by the United States Environmental Protection Agency (US EPA) to have side effects including neuronal changes in the brain areas which controls learning, memory, concentration, and movement. 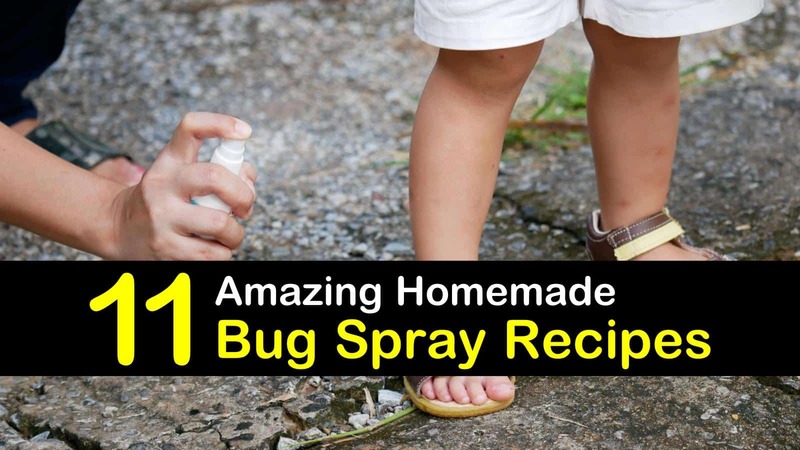 With homemade bug sprays, you don’t risk yourself and your family with harmful substances (..). We hope that you learned a lot from this article. Aside from removing the foul smell of shoes in the closet or the oily scent post-cooking, you can now utilize your essential oils and other household products to keep the bugs off! Also, please don’t forget to share these tips on making homemade bug spray with your friends on Pinterest and Facebook. Use these practical and safe natural bug spray with your family and do not let the bugs bite!